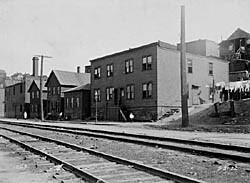 In the second half of the 19th century, this river flats district was a distinctly Irish neighborhood. The wealth of historical data available for this neighborhood, including census records, tax archives, city directories, church records and archeological evidence, provides an unusual opportunity to develop a comprehensive picture of this community. First generation Irish-immigrant laborers lived here from the 1850s through the 1880s. Beginning in the 1820s, Irish immigrants moved to the Ohio City area and were initially employed digging the Ohio and Erie Canal. Malaria was common at the time, but drainage was improved during the 1830s as Cleveland evolved into a major lake shipping port. The 1830s and 1840s brought continued prosperity to the port of Cleveland, but communicable diseases such as cholera were widespread in the low-lying Flats. As a result, low cost land was available for housing the workers who walked to the jobs on the docks. The number of Irish immigrants increased after the 1848 Irish potato famine, and many worked as unskilled laborers and dockworkers, and on the excavation of a new channel and mouth for the Cuyahoga River. In the 1850s, the area of Irishtown Bend was established and dominated by the winding Cuyahoga River with its swampy flood plain. Houses were primarily one or two stories and built of wood. As the second generation of Irish families obtained better-paying work, and dock work was increasingly mechanized, the Irish began moving out of the Flats. By 1900, more than half of this area's residents were of Eastern European origin, although the Irish families still owned many of the properties. 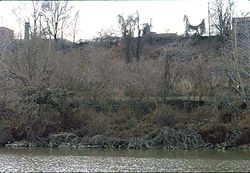 Irishtown Bend was gradually abandoned; by 1910, more than a third of the homes had been torn down. In 1952, only five of the original 80 buildings were left standing. Between 1987 and 1989, the Department of Archaeology at the Cleveland Museum of Natural History began excavations by performing test digs on three properties in the district. The histories of the three families: Connor, Connley and Quinn were determined through numerous sources, and the artifacts from the sites revealed the economic status of each family. The family that was best off financially had a piece of fine porcelain as well as a large set of dishes of the same pattern. They also ate chickens and drank more tea than their poorer neighbors. The poorest family's site yielded dishes of many different patterns (indicating they were purchased or gained one at-a-time rather than as a more expensive set) with many soup bowls, and cheap cuts of stew meat were predominant in their diet. Poor families did not eat their chickens - they sold the eggs that the chickens produced. The study also showed that debris piles associated with these Irish households suggest a lower rate of alcohol consumption than the average Cleveland household of the same period. Today this area remains free of development and well preserved due to the area's soil type, shale bedrock and thick cover of vegetation. Although the buildings are no longer standing, and their remains covered over with demolition debris, substantial data can still be retrieved from the area illustrating life as it existed in the 19th century. Irishtown Bend Archeological District is located along Riverbed Rd. and the west bank of the Cuyahoga River in Cleveland. It is not open to the public, but can be seen from Riverbed Rd.